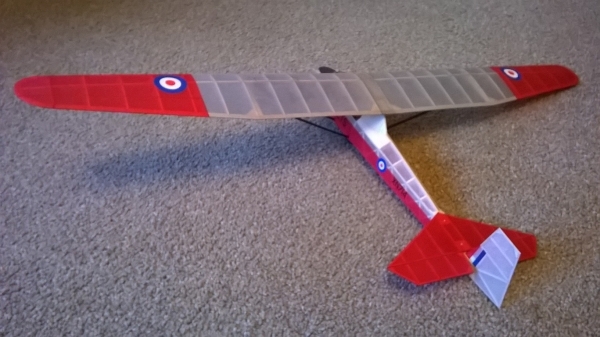 This model has been built for the new glider class at the Indoor Scale Nationals. The competition was run for the first time in 2014 and is at an exciting development stage. The general idea is that the model should be 'launched in the manor of the original' but other than that there are few rules, no static documentation and no qualifying flight time. It's all about experimenting with the aim of achieving a realistic flight pattern and making the model look good in the air. 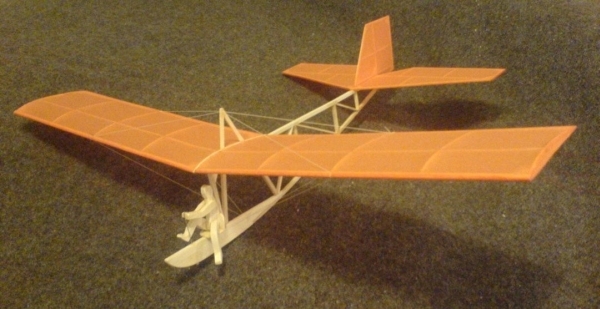 My first model was a semi-scale Primary Glider from the Megow plan. This was a very quick build, overweight and draggy, but proved tremendous fun to experiment with. I would certainly recommend a 'disposable' first model in this class. After playing around with a hand towline and a session unsuccessfully attempting rubber-powered aero-towing with Ian, I've opted for a winch launch. My winch was designed by a friend in the indoor scene who was considering producing them commercially. It's laser cut and has a gear ratio of about 1:6. The towline is nylon bonded sewing thread. The secret to success appears to be small, extremely light gliders with emphasis on clean aerodynamics for a flat glide. This means thin airfoils for low drag. The winner in 2014 was Pete Smart with his 20" span Willow Wren weighing just 6 grams. You can see from this flight video just how slow and realistic the model is in the glide. 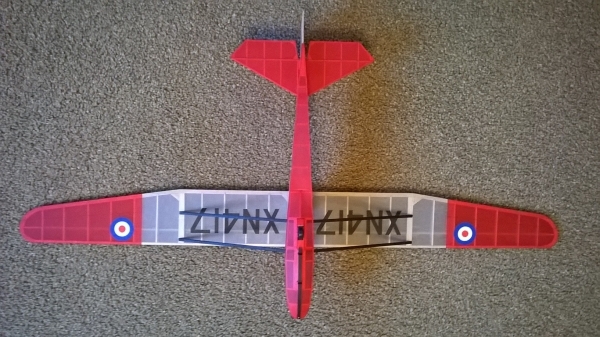 The Slingsby T.31 Tandem Tutor is my own design at a scale of 1:20. This gives a wingspan of 26 inches. The design is fairly conventional and was not intended to be a superlight model. Rather, I was after a sensible entry into the class and a fairly quick build and a simple tissue finish. 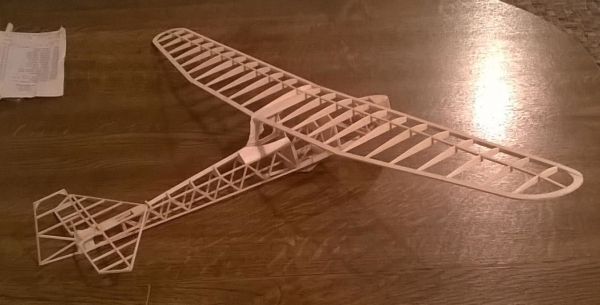 I wanted to see if I could trim a model with minimum dihedral and small tail surfaces. The original aircraft has no dihedral but I gave the model 2.5 degrees. The tailplane is slightly enlarged but has a modest tail volume of 0.45. My weight target (based on a 'cube loading' of 2) was 15.8g. The finished model weighed 14g but with noseweight ended up at 17g. The structure of the fuselage closely follows the fullsize. The model has survived a few head-ons with the wall at Bushfield and has proved sturdy. 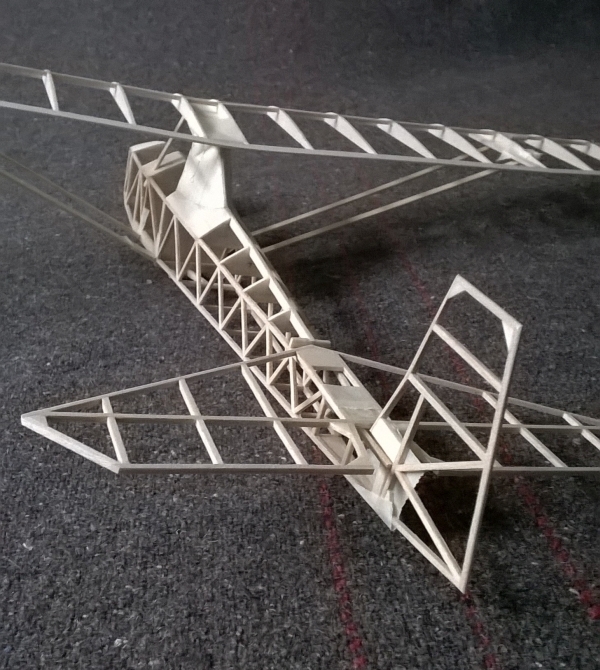 The struts are all balsa covered with tissue and give plenty of rigidity. Tailplane incidence adjustments are possible as it is just pushed onto two small dowels. The tissue covering is mostly red and white esaki, the 'trainer grey' of the wings was colour printed. The markings are a combination of printed and cut tissue lettering. The wheel and skid are both functional, the 'doughnut' suspension has a little give. The skid is laminated from 1/62 ply. 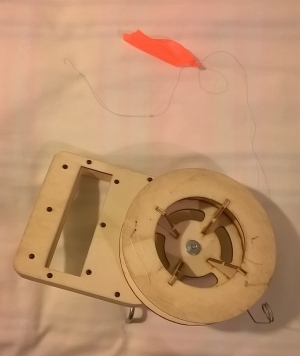 The wheel is turned from balsa with an aluminium hub and pin axle. 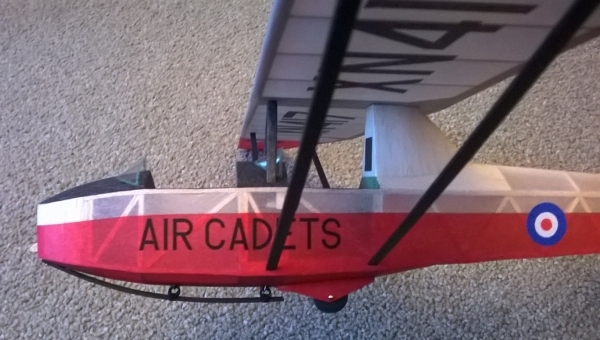 First flights with the Tutor were made at Bushfield in January. 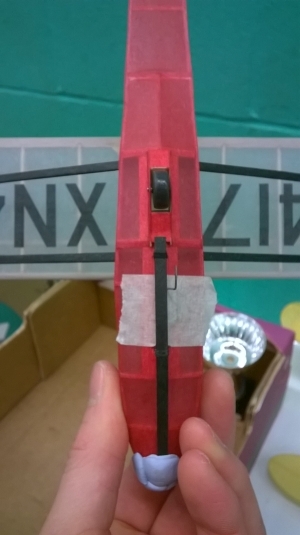 My initial thinking was to use rudder to give a turn and oppose this with 'aileron to keep the wing up' as you might with a rubber model. The Tutor had other ideas however - it just flew along crabwise! 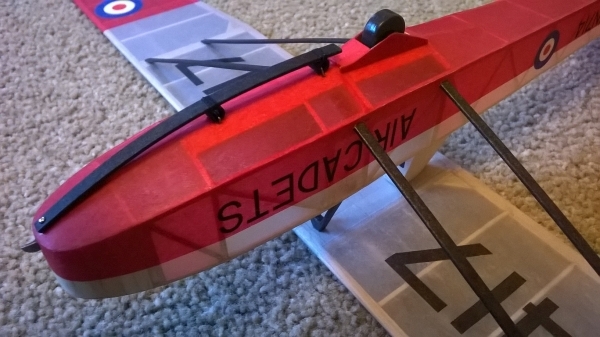 So I ended up ignoring the rudder and setting the turn with an aileron trim tab. This was an important lesson for me: with the high aspect wing and minimum dihedral, roll control was far more important than rudder control. The model proved to be spirally stable but it does lose some height before levelling out. Flights on the winch turned out to be really satisfying. For once, I learnt what the model wanted before I broke it and hopefully the next session with it will see some higher launches and steady circuits. Practice at winching technique will certainly be the key to consistency. When it all goes right, the model runs along the ground for a few feet, rotates and climbs out steeply. Transitioning into the glide overhead, the towline releases and flutters down while the model heads out into a wide right turn. All too soon the model is down, rolls out for a second or so and teeters over on to its wing tip - just like the original. Hopefully the judges at the Nationals will agree! First a disclaimer: indoor gliding is strangely satisfying and highly addictive! 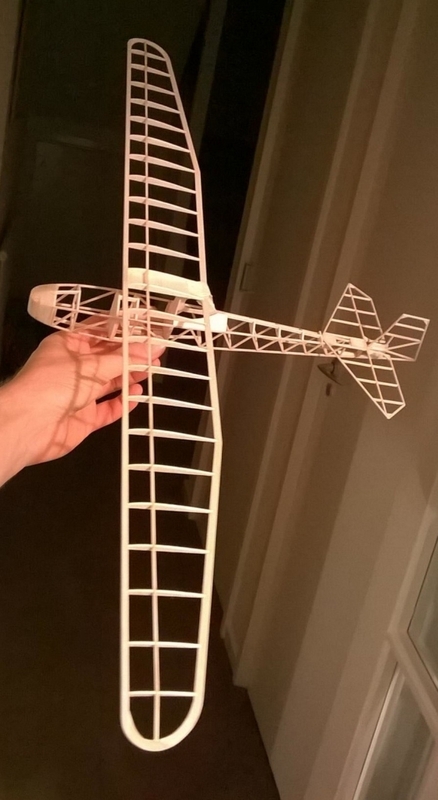 A disposable first model is definitely recommended, something like a primary glider or even a profile model. Much can be learned from a simple model and with only an evening invested, it will provide good 'fun value'. 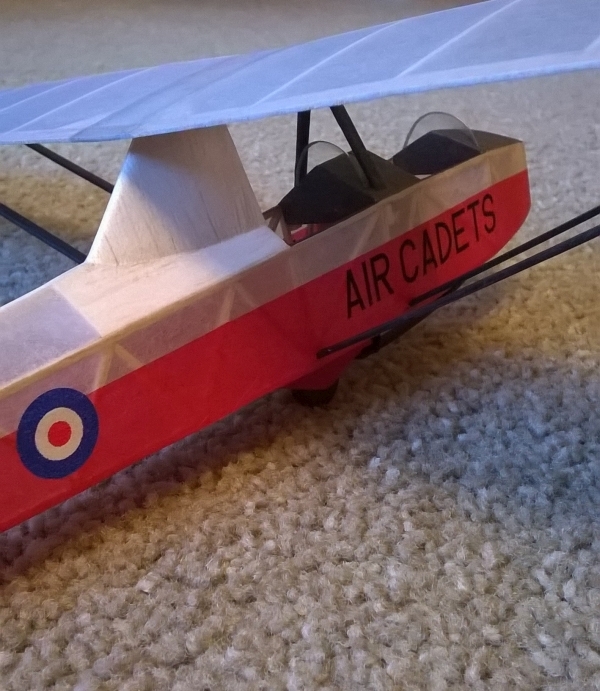 There are plenty of scale glider plans around but many are ‘outdoor’ models and could do with some weight reduction and thinning of airfoil sections. 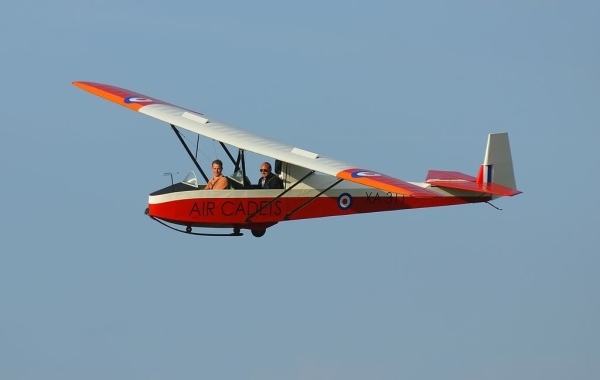 Classics like the Veron Prefect and Frog Skylark have been successfully flown indoors (Andy Sephton and Russ Lister respectively) and searching Outerzone.co.uk comes up with lots of plans. 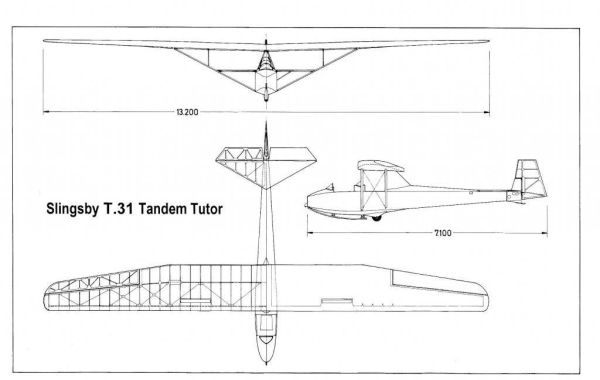 Mike Stuart has also provided the Skyleada glider plans on his website. These are small and with light construction just about perfect for indoors, especially with single covered flying surfaces. The Slingsby Falcon in particular looks just the job. There is full size example flying and plenty of photos for reference, it would look great finished in coloured or printed tissue. There is massive scope for scratch building, but I would be inclined to follow Pete Smart’s example and build a light, single surfaced model. The key to success appears to be a very low wing loading combined with low drag. 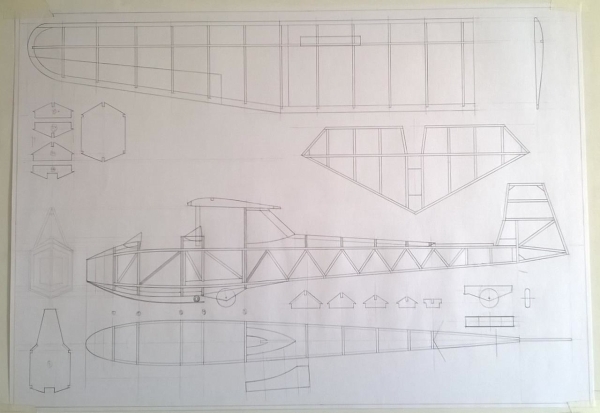 A prototype with moderate aspect ratio and a clean airframe would be sensible but I also have dreams of a high aspect ratio modern composite sailplane with sheet wings, moulded canopy and a planked fuselage!